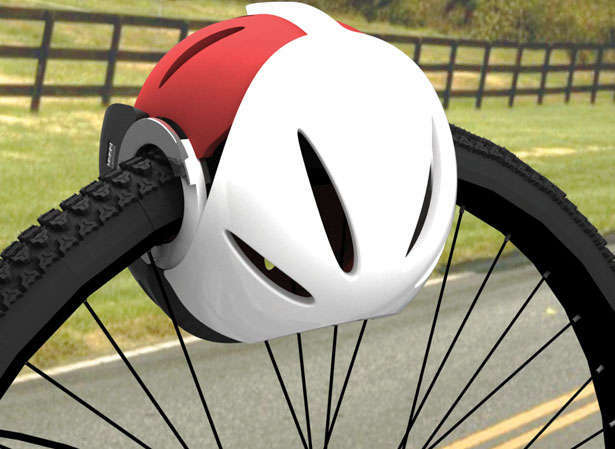 Un casco para bloquear la rueda de tu bicicleta. (En inglés) - Bicivilizados. Ciclismo urbano. Alegría entre tus piernas. If you use your bicycle as your primary means of conveyance to class, work, or any other commitments, you may be tired of toting your lock and taking your helmet along with you once you’ve reached your destination. The Head-Lock Bike Lock is a brilliant solution developed by Kwon Zion, Lim Seokjoong, Na Hyesook and Kim Younghye that limits the number of knickknacks you need to keep track of. The padded headpiece that bikers should sport each time they hop onto their two-wheelers gains a second function, far more useful than dangling obnoxiously from the strap of your bag. After dismounting your bicycle and removing your helmet, an effortless rotation of the shelled form creates a clamp. The Head-Lock Bike Lock can thus be placed around the wheel of your ride, making it impossible for the tire to turn full circle — unless you know the code to the combination lock.